WASHINGTON (PAI) — The causes the late Dr. Martin Luther King Jr. fought for, including racial justice, economic equality and ending a misguided war “are very much with us today,” says a labor historian and author of a new book putting the civil rights leader’s last days into a longer and wider perspective. University of Washington historian Michael Honey, speaking at a March 31 commemoration of King at the AFL-CIO headquarters here, added that many of labor’s present foes are the same ones the civil rights leader faced while supporting striking sanitation workers in Memphis, Tenn., before he was gunned down 40 years ago, on April 4, 1968. “The city leaders” of Memphis “were mostly white, mostly racist, mostly ignorant and mostly appalling. The only thing I can compare that with these days is George W. Bush,” Honey said. 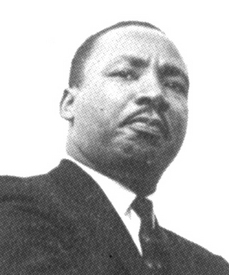 King, Honey said, “was the best at appealing to people at all levels” and overcoming such divisiveness. In the present day, activists should try to follow in his footsteps, but must be careful that “if you want to change the situation” in the United States, “you have to do it without creating more of that situation you’re trying to change,” Honey advised. Honey’s book, “Going Down Jericho Road,” available at bookstores and from the AFL-CIO, traces both the history of the civil rights movement and its relations with labor. King himself, early on, recognized the unity of the two, saying in 1961 that causes labor fought for would benefit African-Americans and vice versa. But Honey also made the point that “the movement shaped Martin more than he shaped the movement,” and King often had to respond quickly to civil rights developments or other events he did not initiate. That included, Honey said, King’s realization that growing economic inequality was the unfinished business for both unionists and civil rights activists.